Intimate partner violence is a pervasive problem in the United States. intimate partner violence is often repetitive and may escalate; in a small number of cases, intimate partner violence leads to homicide. 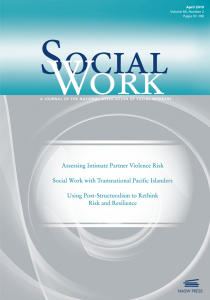 In a recent issue of the journal Social Work, co-published by NASW Press and Oxford University Press, an article presented an evidence-based practice model for risk-informed social work intervention with survivors and perpetrators of intimate partner violence. The evidence-based practice model combines the best available research evidence, practitioner expertise, and client self-determination to guide the most appropriate intervention. Intimate partner violence risk assessment instruments provide the best available evidence of future re-assault, severe re-assault, or homicide. Practitioners who implement intimate partner violence risk assessment can use their expertise to adjust risk scores and to suggest risk mitigation strategies for their clients. Examples of risk-informed social work practice include the safe removal of firearms, safety planning around separation, and mitigating the negative consequences of strangulation and sexual violence. Clients ultimately use their self-determination to decide which risk reduction strategies to implement. An evidence-based practice model can be used by social workers in all areas of practice to provide risk-informed social work interventions.